May 11, 2018: The Mars Helicopter, a small, autonomous rotorcraft, will travel with NASA's Mars 2020 rover, currently scheduled to launch in July 2020, to demonstrate the viability and potential of heavier-than-air vehicles on the Red Planet. 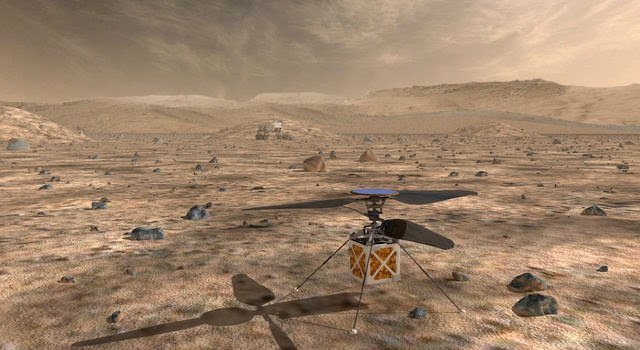 Started in August 2013 as a technology development project at NASA's Jet Propulsion Laboratory, the Mars Helicopter had to prove that big things could come in small packages. The result of the team's four years of design, testing and redesign weighs in at little under four pounds (1.8 kilograms). Its fuselage is about the size of a softball, and its twin, counter-rotating blades will bite into the thin Martian atmosphere at almost 3,000 rpm—about 10 times the rate of a helicopter on Earth.